Before you make a booking request, you want more information? Use this form and we will answer you as soon as possible. You can also reach us on +33 (0) 4 93 58 82 88 or by mobile on +33 (0) 6 16 92 59 15. We are at your disposal. Enjoy the best rates by dealing directly with us! Enjoy the best rates by reserving your rooms online! 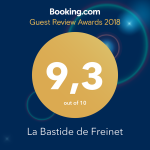 We are happy to welcome you to La Bastide de Freinet. Do not hesitate to contact us if you want more information, we are at your disposal.